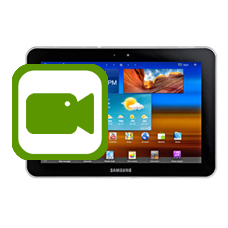 Does the front camera on your Samsung Galaxy Tab 8.9 no longer take pictures, takes fuzzy pictures or shows artifacts on the tablet screen? Maybe the camera pictures have a coloured tint? If so your rear or front Samsung Galaxy Tab 8.9 camera is no longer working correctly, we will replace with a brand new rear camera part. * Price includes a brand new front camera assembly, fitting and fully insured return shipping in the UK. This is an in-house Samsung Galaxy Tab 8.9 camera repair service, when ordering this rear camera repair service you are required to ship the Samsung Galaxy Tab 8.9 into our repair centre for works to be completed.